Panathlon Event - March 2019. This year we took a team of 6 children to the Penathlon event at Hartpury College. We finished joint 5th out of 11 teams which is a huge achievement and we are so proud of the team for how the represented the school and themselves in the event! Well done to all who were involved. Mr F.
Football Match vs Ann Cam - March 2019. 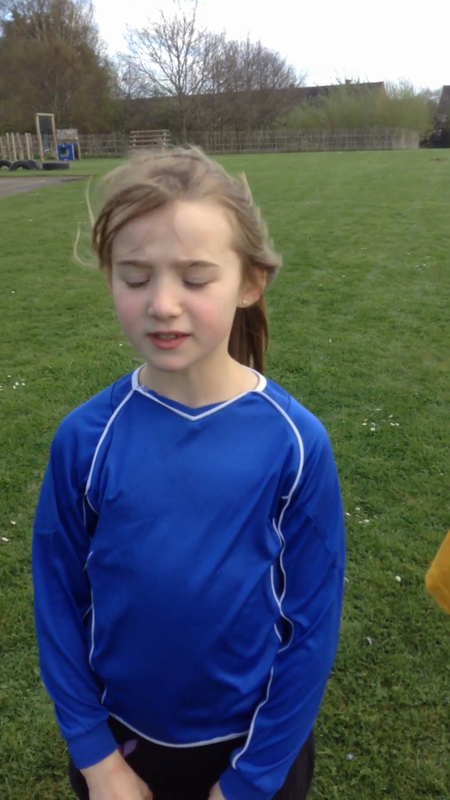 In a closely fought contest, Picklenash were unfortunate to come away with a loss of 3-2 to local school Ann Cam. Thank you to all parents who came to watch and well done to all children who respresented the school. Netball at NCS - March 2019. Our netball team came 5th in their group in the Netball Competition which is a great acheivement! Well Done all! Primary Hockey @ NCS. Well done to our Hockey team who represented Picklenash at the Primary Hockey Event at NCS. We finished 3rd overall which is a great achievement! A challenging course for our District Cross Country runners at NCS! Despite the conditions, our cross country runners shown great attitude and willingness to show their best throughout. All runners represented the school with amazing behaviour and spirit and Mr Fowler is incredibly proud of our team. As part of our value this term (perseverance) a special shout out to Ellie Trigg who completed the course at her first time to the event!! Another mention for Leo Shankster who completed the course and qualified for the county race. Well done to all runners. Gilrs Indoor Football @ NCS. 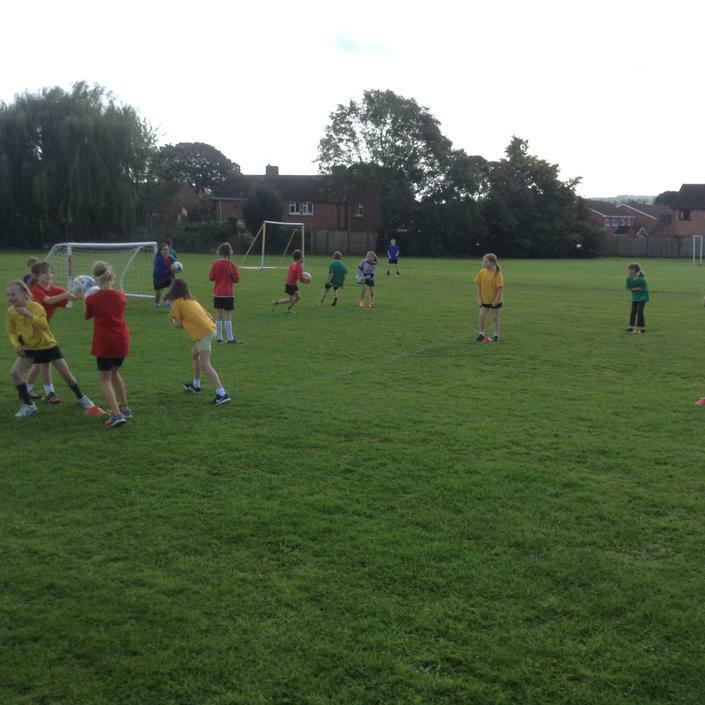 A huge well done to our girls football team who entered the girls football competition at Newent Community School! The team have worked incredibly hard to take part in the event and they should be extremely proud of themselves. They shown fantastic team work, perseverance and togetherness throughout and had an amazing time playing football. Well done girls! Indoor Athletics. Great effort by our team who entered this competition. They represented the school with a fantastic attitude and togetherness. A huge well done to our Cross Country team who participated in the Local Schools Cross Country event! All runners can be so proud of what they achieved and we had great times all round. Year 1/2 have had a great start to the new year in PE! 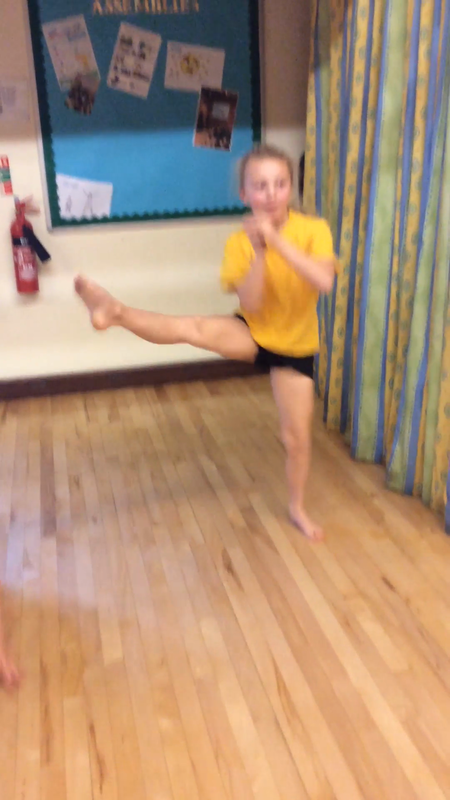 This term we have focused on movements and balance and had so much developing these skills. We discussed how to move with control and how to control our bodies to perform different activities. The children have worked incredible hard on developing their skills. 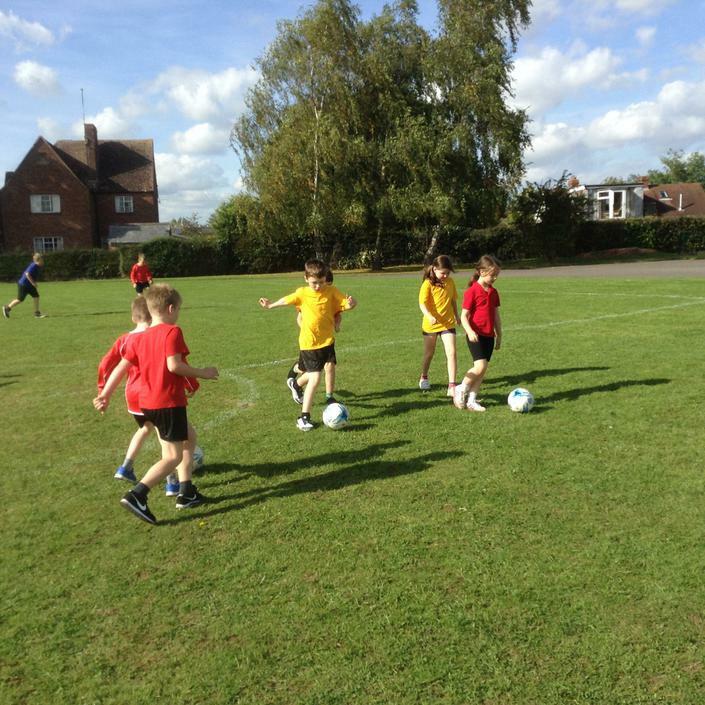 Our year 4/5 football team came out on top against a brilliant Tibberton side! Well done boys on winning 7-1. Man of the match was Harry Thomas. The children absolutely loved the Archery Event at Newent Community School! Quad Kids Athletics event at Dene Magna. Huge well done to our team for finishing 10th our of 13 schools! 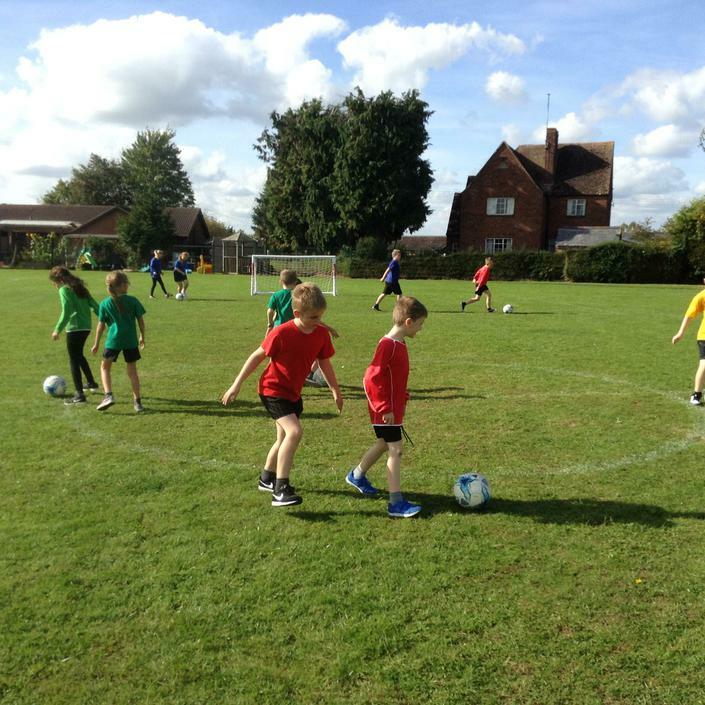 World Cup fever has gripped the children at Glebe and Picklenash as they take part in their very own mini world cup activity day! This term we took a team of 12 KS2 children down to Newent Community School to take part in the GPJ Multi-Sports competition. This year the tournament had a new layout where each school plays against another school for the duration of the tournament and earns as many points/scores to come top of the points charts. We played against Soudley Primary School (who were absolutely amazing by the way) in Athletics, End Zone ball & Kwik Cricket. The day was extremely hot but a huge success for us as we came away winners of the Large School trophy. Huge congratulations to this magnificent achievement to, Hayden Agnew, Maddie Scott, Natasha Scofield, Millie Panting, Alicia Holford, Leo Shankster, Lucy Evans, Sam Evans, Harry Thomas, Finn Trail & Alfie Nelson. GPJ Multi-Sports Large School Winners!! Fencing in PE? A new sport for the children this term in Year 3/4 and they absolutely love it. Mountain Biking at NCS. What an experience for the children!! Panathlon at Hartpury College, we finished 3rd place!!! Soccer 7 Football Competition at NCS. 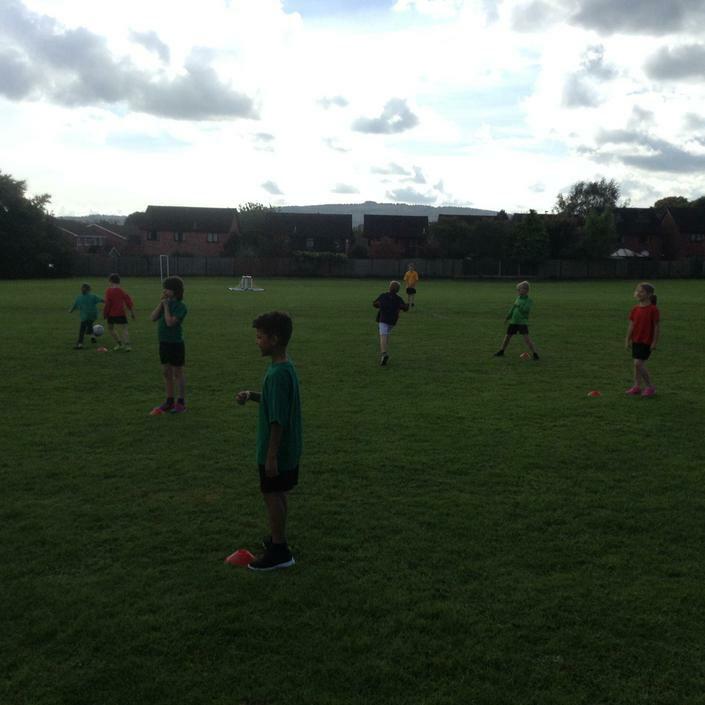 We took a team of 9 children down to NCS for a football tournament which involved 10 local primary schools. 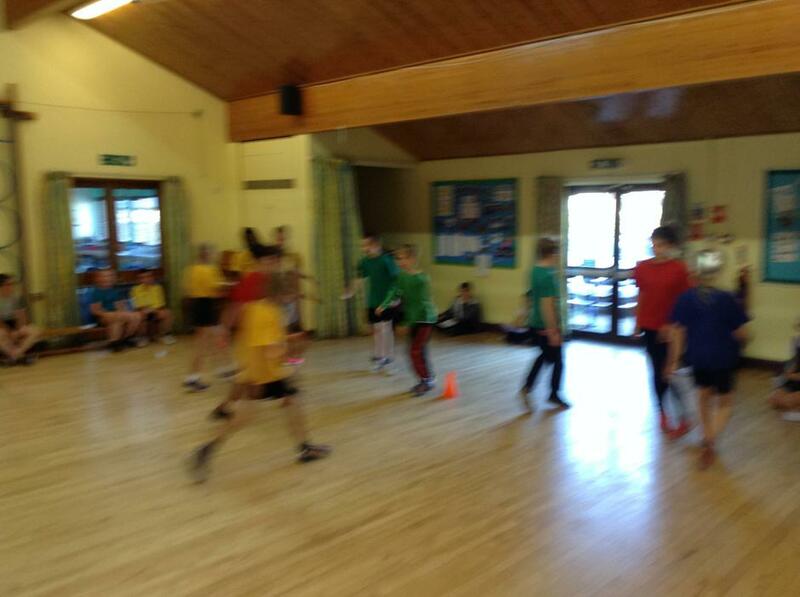 The children were in a and group with the likes of Mithcledean, Westbury and Hopebrook but played extremely well! We won 2, drew 2 and lost 1 which is an incredible effort and managed to qualify for the play off games. We faced Ann Cam for a place in the final but unfortunately lost 1 - 0 but did beat Mitcheldean in the 3rd vs 4th play off game which meant we finished 3rd overall. Leo Shankster, Hayden Agnew, Finn Trail and Sam Evans were our goalscorers. The team represented the school brilliantly and showed excellent team work, determination, effort and responsibility to earn a 3rd place finish! Well done all! Fitness equipment during our lunch break! This term year 1 & 2 from Opal and Topaz class have been developing their understanding of Gymnastics. We have looked at balances, shapes, travelling, jumping, mirroring, apparatus work & sequence building to create a mirrored sequence at the end of therm. All children really have worked incredible hard and have progressed so well, we are very proud of their development and their control. Well done ALL! This term year 3/4 have been experiencing Yoga in their PE lessons. We have talked about the benefits of yoga from relaxation, relieving stress, body flexibility, strength & mindfulness. The children absolutely loved taking part and giving this new sport a go with children towards the end of the term delivering parts to the rest of the class. It's important that we not only look after our body through physical activity but our minds to ensure we lead a healthy lifestyle. We now are planning to run a Yoga afterschool club. Cross Country at NCS Jan 18. We took a team of 14 year 5/6 children to the Cross Country County selection race which was held at Newent Community School. The course was tough having to go through mud and woodland area but ALL children represented the school fantastically and showed great effort and determination. They all pushed themselves to get the best time they could and never gave up which is brilliant! We had 3 children qualify for the next race, Hayden Agnew, Olivia Walters & Natasha Scofield so well done to them and well done to the team for a great race! GLOW in the dark ENRICHMENT day 2017. Quick Sticks Hockey at Newent Nov 17. Well done team! Indoor Athletics Team Dec 17. 3rd place. Well done all! 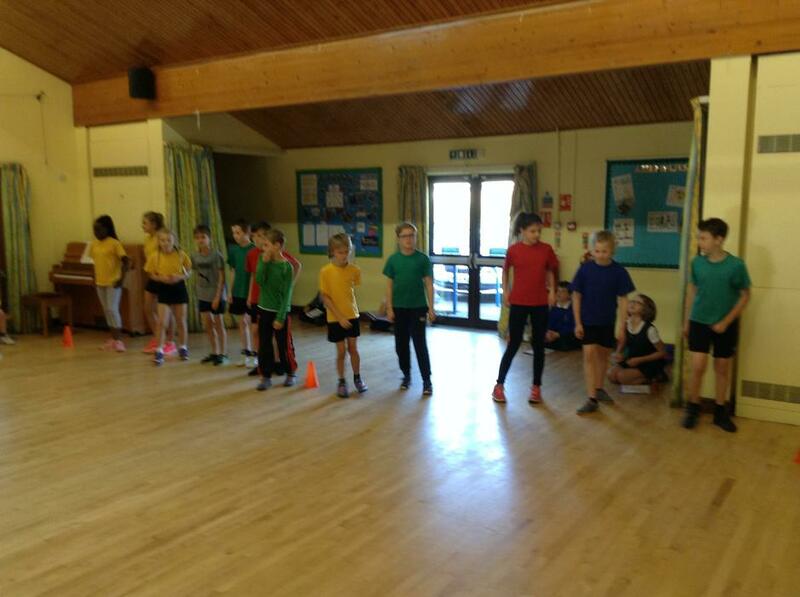 This term the year 5/6 children have been performing street dances during their PE sessions with Mr Fowler. They have been practicing their poses, movements, steps and swagger to create some fantastic ideas for their dance routines. They all worked incredibly hard and really delved into their creativeness to explore different poses and shapes they could make. Truly amazing experience, well done all!. This term the year 1/2 children started PE with Mr Fowler and have been working incredibly hard! They have been working on their fundamental movements and how to control their bodies whilst moving. Below are some pictures during a session where moving over ladders and using the fitness equipment tested the children's movements. The ideas they came up with of how to move over the ladders were fantastic and the control they are starting to show is brilliant! Keep up the good work everyone! 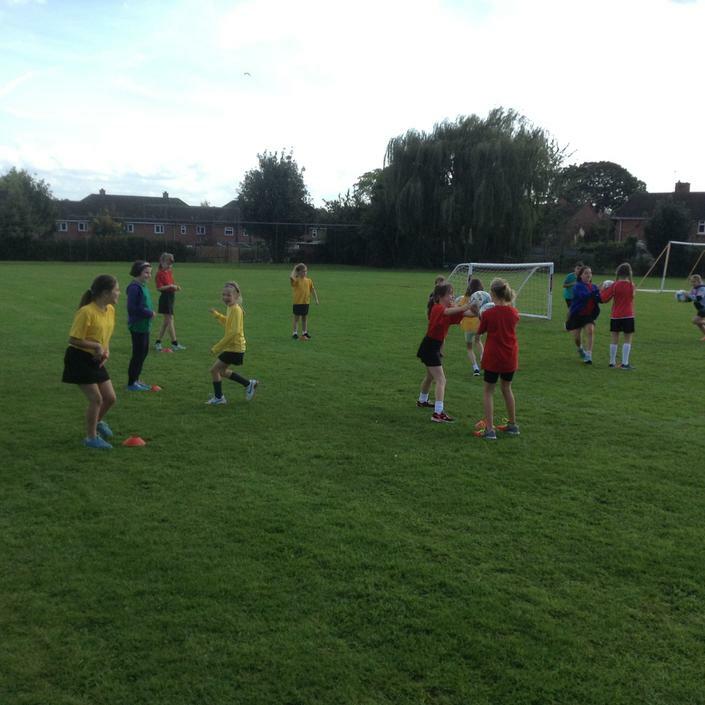 Lunch time Inter House Football has started with great numbers! With the new year comes new sports captains and new children to play in their teams to earn points for their house. 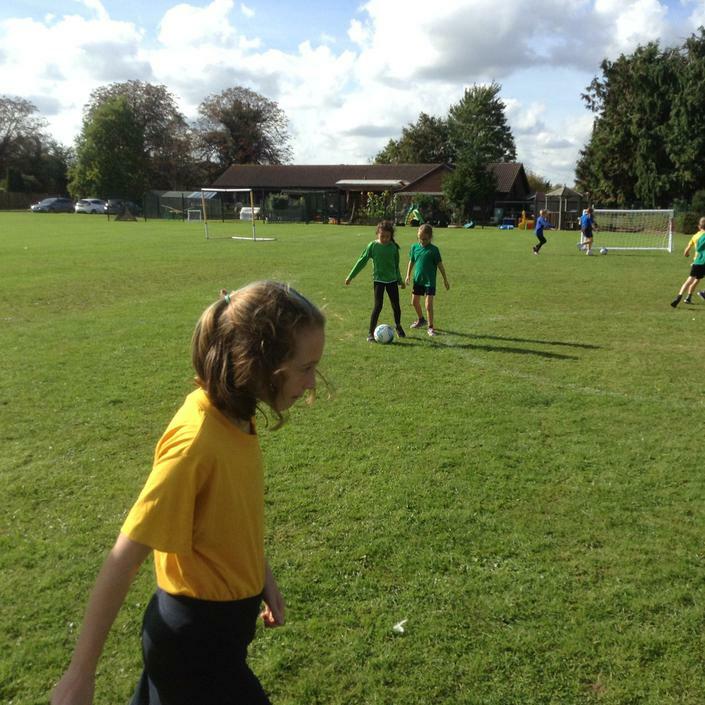 Every Thursday we have an inter house football game where anybody in ks2 can take part. The start has been incredible, with more children taking part than last year! The games have been played with great sportsmanship, togetherness and teamwork and the children are enjoying their lunch time! 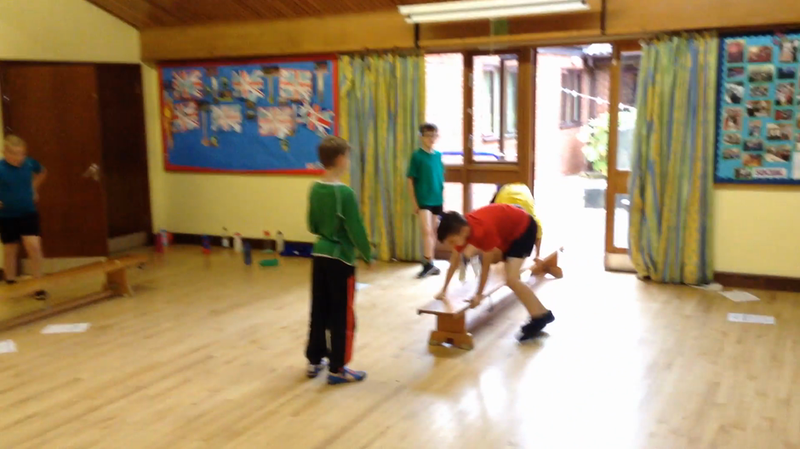 The year 6 children working hard during their circuit training lesson! This term the year 6 children has been developing an understanding of how to keep our bodies fit4life. They have worked incredibly hard over the past 6 weeks taking part in circuit training for different muscle groups of the body, cardiovascular and muscular endurance challenges and also the bleep test. The group have never stopped working hard and are starting to gain a real understanding of how we can look after our bodies with exercise for a healthier life going forward. The children interest, questions and engagement has been amazing and we look forward to carrying this on throughout the year! Well done year 6! Year 4/5 have had an amazing start to the new year in PE. What a fantastic start the year 4/5 children have made in PE. The focus, determination and application has been amazing and they really have worked hard. This term we were focusing on invasion sports and developing our understanding of the skills required when working as part of team in these games. Dribbling, control, agility, co-ordination, passing, tactics, defending/attacking and possession have all been tested and the groups have responded well. 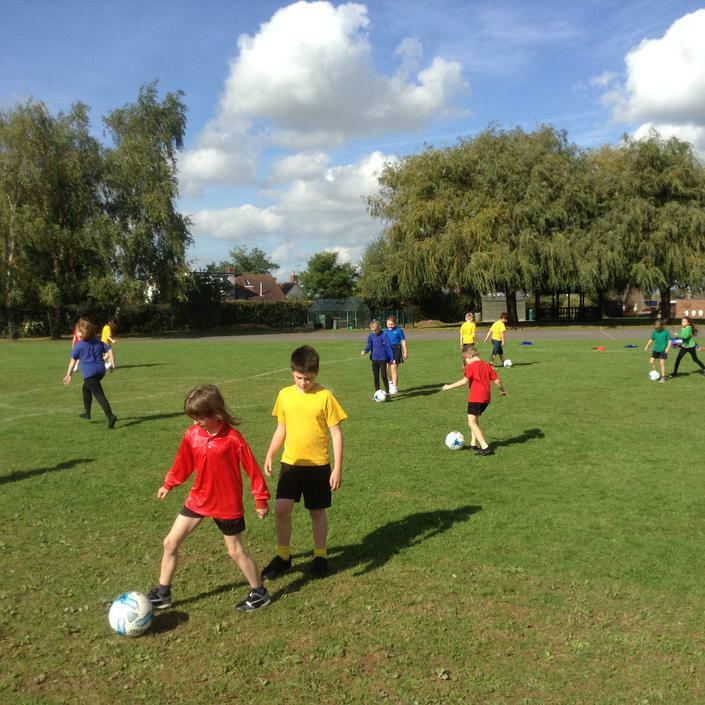 The start of the new year brought new challenges to PE with the year 3,4 this term. We have working on developing our understand of co-ordination and how we use co-ordination in all sports. Looking at different sizes balls, different equipment and challenging ourselves in a variety of situations. The classes have started incredibly well and have been working extremely hard to progress themselves but also help others which is great to see! Keep up the good work! Pictures coming soon! Well, what a truly amazing sports day we had this year! The weather was on our side and the day was a huge success! All 4 houses shown brilliant team work, enthusiasm, encouragement, team spirit and most of all effort. The children were fantastic and we really couldn't ask for more from them! We want to a huge thank you to all the parents who came to cheer on the children, we really do appreciate your support and the children loved having you there. Without your support days like these wouldn't be as brilliant to be a part off. We also want to say a massive thank you to the children who really did give the school the best day ever and shown that sport for them is important. Staff also who worked hard to make sure events are filled, scored and ensured the day ran smoothly. After the interest and success we had taking part in the county Cross Country Event at Newent Community School earlier this year, Mr Fowler and Miss Nuttall decided to run our very own Cross Country event for Years 2,3,4,5&6. 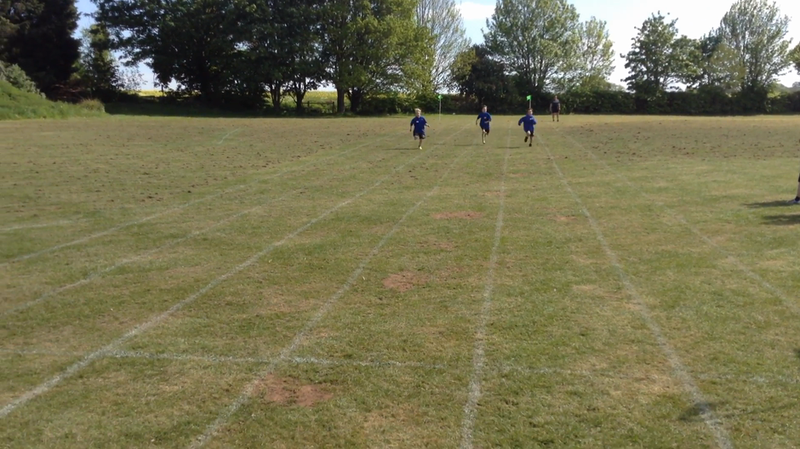 They set a track up on the school field which also led onto the playground and had 3 races, one for year 2 (2 laps), one for years 3&4 (3 laps) and one for years 5&6 (4 laps). We had over 50 runners which was absolutely fantastic and shows the interest we have from the children in sport, to take part and in some cases try something new! Each race was brilliant with every child giving it a very good go and never giving up, they all showed encouragement towards each other and the cheering was amazing and really pushed their peers on to finish! It was fantastic to see so many children come together to enjoy taking part and being part of one big team and the staff were so proud of the children and their efforts. We also wanted to say a huge thank you to the parents who came to watch and cheer on, we really do appreciate your support and the children loved having you there! We now have plans to make this a yearly event. Special mention to Millie Atkins who really do push herself to finish the race, dug deep and never gave up! We were very impressed with her determination and attitude so well done Millie. Once again, a huge thank you to all children, staff, parents and helpers for making the event a huge success! On Thursday 15th June 2017 we took 8 children to participate in the 'Panthlon Finals' held at Hartpury College. Previously we had taken part in the Panthlon event where we qualified for the finals. The Panathlon event gives SEN children the opportunity to take part in a range of sporting activities. Some of the games at this event were Table Cricket, Messi Football, New Age Kurling and Precision Beanbag. The event runs in a round robin format and children get to play all sports in their teams. The games are perfectly adapted for all abilities and gives everyone the chance to take part and score points for their team. Our team was Amy Ellis, Ty Rogers, William Loughrey, Nikodem Szubert, Corey Hale, Samantha Whatcott, Dylan Danter & Ellie Trigg and I have to say I couldn't be more proud of them. They worked incredibly hard and the team spirit they showed was truly inspirational. All the group gave everything a go and showed that their confidence is building in sport and creating friendships with others. In the past 2 events, it has been absolutely fantastic watching the group grow and enjoy playing sport, we really cannot wait for the next event! I wanted to make a special mention to William Loughrey, William came away with the 'Panthlon Highly Recommended Prize for Outstanding Achievement in 2017'. William has shown that no matter what your circumstances are you can always achieve and excel in what you want, just never give up! Well done William. What a fantastic day we had at Hartpury College for the Panathlon Event! Mr Fowler & Miss Nuttall took a small group of our year 3/4 children to take part in this years Panathlon Event at Hartpury College. The children got to experience sports such as 'Boccia Blast', 'New Age Kurling','Table Cricket' and 'Parachute Popcorn' along with children from 6 other schools. As you can see from the pictures below our children absolutely loved their day playing new sports and making new friends and most importantly had fun whilst participating in sport. The children came away with a medal and a T-shirt and we already cant wait till the next event! They came away with a new found confidence and willingness to try new sports and learn new skills. It was amazing to see everyone give it all a go and sometimes go out of their comfort zones to try something new! On March the 28th we took part in the Newent Cluster Primary School Swimming Gala @ Newent Community School and came in 2nd place! The event was absolutely fantastic and the children thoroughly enjoyed themselves which is just amazing, the races were both individual and team relays and the effort and commitment the children put in really was tremendous. It was a very close competition, especially between us and Hingham who won the event with only a few races ensuring the win for Highnam. However, we came 1st in 13 of the 27 races and children from Picklenash set 3 new records. Lucas Holford set a NR in the Year 6 Boys Butterfly and Year 6 Boys Individual Medley & the Year 4&5 Girls (Ellie Meek, Alicia Holford, Olivia Walters and Amelia Pontin-Medes) set a new record for the Girls Medley which is superb! The event was a great success and you really felt all children from all the schools worked together as one big team to encourage, inspire and communicate to make the event the best it could be! We really are so proud of our team once again for the way the represented the school and themselves! Mr Fowler & Miss Nuttall very much look forward to the next event after the Easter Holidays. 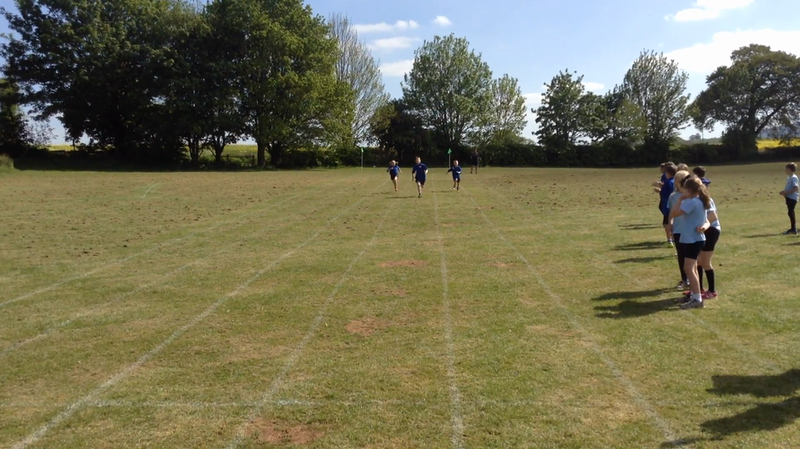 Today children in Years 5/6 enjoyed completing circuits in the sun. In Year 5/6 we love working out and getting fit. Recently, we have been taking part in boot camp training once a week which has pushed us hard and increased our fitness levels. On Tuesday28th of February we sent 21 children from KS2 to represent the school at the 'District Cross Country' which was the most from any of the schools who attended! (It shows how keen and interested our children are becoming in sport, to participate and compete) @Newent Community School. The girls set off first and then the balls set of around 10 minutes after. It was a very wet and windy day BUT the children did us so proud! All children really did give 110% and we could not have been more proud of the children. Other schools at the event commented on our children's togetherness, encouragement, helpfulness and effort which was truly fantastic! The children set some great times and came up against some of Gloucestershire top young runners so really should be proud of their time! Mr Fowler and Miss Nuttall want to congratulate all the runners for what was an amazing show and want to give a special mention to Kai Haines who stopped running in order to help a student from Primrose Hill School who had fallen, he stayed with them until help arrived so well done Kai! Another fantastic event and we look forward to the next! 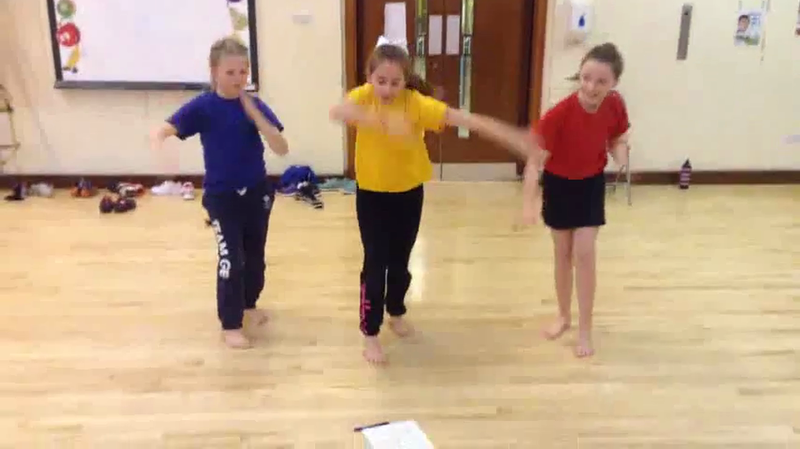 Short video of our Bollywood Dance ideas in small groups. Sapphire & Coral class during one of their Bollywood Dance Lessons!